With his superstar hobbling and the Charlotte Bobcats refusing to go away, Phil Jackson never got terribly comfortable while becoming the winningest coach in Los Angeles Lakers history. Andrew Bynum had 17 points and 14 rebounds, and Lamar Odom scored 19 points while making several big plays down the stretch, making sure Jackson added another superlative to his matchless coaching career in Los Angeles’ 99-97 victory over the Bobcats on Wednesday night. 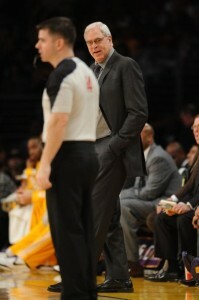 Jackson, also the winningest coach in Chicago Bulls history, passed Pat Riley with his 534th win with the Lakers. The Hall of Famer won 545 games and six titles in nine seasons with Michael Jordan and Co. before winning four more rings in his first nine seasons with the Lakers, rising to fifth on the NBA’s career coaching victories list when he passed Charlotte’s Larry Brown earlier this season. Jackson is the winningest playoff coach in NBA history, and the only coach to win more than 70 percent of his regular-season games. Against the pesky Bobcats, he managed to coax a late-game win out of his Lakers even with just a season-low five points from Kobe Bryant. Bryant, who is playing on a sore foot, had his worst ever NBA game in which he played at least 30 minutes. Jackson has had great success as his coach, but its been his good fortune to coach some of the best talent the NBA has ever seen. He is at this moment, 64-years of age. I predict Jackson to quit coaching within the next 3 years. Kobe Bryant Wants Out, Again! The Short Bus: Kobe, Wants To Stay?